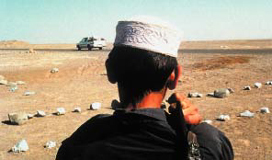 Shot over five months in 2002, Michael Winterbottom’s In This World starts out as a documentary about the plight of Pakistani immigrants that travel by land to London in search of a better life, then quickly morphs into something more interesting. Telling a fictionalized story about real-life, teenage refugee camp inhabitants Jamal and Enayat, the movie opens with a voiceover explanation of conditions of the camp where they live and of the realities of the people-smuggling trade. There are less that five minutes of this narration, however, before the movie launches into the expansive tale of their journey to escape poverty. As they travel from city to city, by bus, foot, and boat, a 3D world map charts their progress, Indiana Jones-style. I found it to be a helpful device, but it might strike some as oversimplification. In any case, this approach makes it clear that Winterbottom doesn’t want the audience to be able to forget that this story, while fabricated, is decidedly grounded in reality. As we watch the duo make their dangerous trip, it becomes apparent that they are playing a game of chance with their lives at stake. They bribe one patrolman who suspects they are Pakistani with a Walkman, but have no such luck with another, leading to a twist of fate that sets them back a week and underscores just how random success is to people in their shoes. As they travel, they meet people sympathetic to their situation and, occasionally, people who want to exploit them. They move covertly, hidden among sheep, fruit and, most harrowingly, for forty hours in a pitch-black cargo hold. They perform manual labor, beg on the street, and even steal to finance the next leg of their voyage. Their journey lasts for several months, and it takes on a certain kind of rhythm. Languorous periods of inaction, during which they helplessly wait for their signal to move again, are disrupted by the chaotic periods during which they travel. They get shuffled from place to place with little knowledge of where they’re headed, and as they go from Iran to Turkey to Italy to France, there’s little difference in the tone of the piece. The first ten minutes of In This World, which show Jamal and Enayat’s life at home have a fast impressionistic feel to them that I fully expected to slow down once they hit the road. It never does though. The movie, which features the best editing of any film this year so far, utilizes a unique construction that manages to squeeze a genuinely epic feel into an 88 minute runtime. 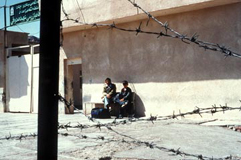 Ten days snap by with a title card while they’re waiting for someone to take them to Tehran, but the boredom the two young men feel can be inferred by looking at their faces. 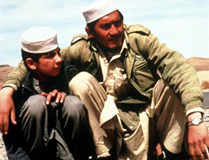 The presentation of their journey is made up of small snippets of their experience (they change clothes to fit in in Iran, Jamal teaches English to Enayat while they ride in the back of a truck, and so on) that manage to form a cohesive emotional whole. Improvised glimpses at the landscape (there’s a stunning shot of a storm gathering that couldn’t have been planned) and unchoreographed crowd scenes dominate the movie. It’s impossible to call In This World melodramatic because it never develops dramatically. It only tosses us into Jamal and Enayat’s struggle. The shots are put together rapidly, and it is sometimes disorienting, but that only helps to convey something of their experience of being cast into unfamiliar situations without much bearing, at the mercy of those in control of their fate. It may sound like an oxymoron to people who haven’t yet seen In This World, but the innovative style that Winterbottom uses feels like a fusion of lessons learned from the Italian Neorealist and French New Wave movements. 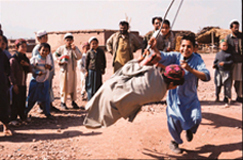 Winterbottom is clearly aware that we’re used to getting our information about predicaments like the Pakistani refugee crisis in the documentary form, so his appropriation provides an in into the story for viewers that also underlines the inescapable notion that this is a real problem, and not just the plight of a fictional character. The film manages to put a human face on a social problem that is all to easy to ignore, and while I don’t exactly agree with its politics (for reasons of self-preservation a nation needs to separate political refuges from economic ones), I don’t think that hampers my opinion of the film at all. The best film by one of our most versatile directors, In This World stands out among most contemporary cinema because it strives for connection where so many films look at the world and find only reasons to be alienated. The majority of people in In This World are genuinely empathetic, though that might reflect the personality of a filmmaker that would undertake a project such as this more than the realities of the world. An exceptionally emotional experience throughout, it perhaps reaches its subtle crescendo during the scenes where it observes people in varying political and economic situations all playing soccer. Because Winterbottom clearly relates to this footage, and because the well-placed music underlines the connection, these brief shots transcend the trite and register on a profound level. Shot on DV, In This World has a dusty look, but it’s a film that wouldn’t be possible if it were made with conventional equipment. A constant series of images both beautiful and miserable, it features scenes, such as a treacherous nighttime run across the Turkish border, which simply wouldn’t exist if it wasn’t for the technology that is employed. Always respectful without ever pandering, In This World is one of the year’s prime cinematic and humanist achievements.